I get quite a few hits on the old articles about the old Servo Tester, it was a useful tool but I never quite got it to a state I would have been happy to sell. A little while ago I decided to start from scratch, designing something that would be viable to sell. So here we have the all new Servo Tester. Quite a handy little box! It doesn’t have it’s own battery, partly because shipping batteries over seas is a bit of a minefield, and partly because I think it’s more flexible to be able to connect any common RC receiver battery, a 4-5 cell NiMh for example, so you can test the servo with the final power source. The Servo Tester doesn’t have any complex menu’s to faff about with, instead when you connect a servo and battery it’ll immediately start outputting a servo pulse to match the position of the knob. A short press of the button toggles between the manual position and the centre (1500uS), making it easy to adjust linkages. Another short press toggles back to manual control. As well as being able to directly control standard RC servos, the Tester can also display the pulsewidth from another device. You can connect the Tester directly to a servo channel on a standard RC receiver, and as long as there’s a pulsewidth on the signal pin the Servo Tester will display the pulsewidth and pass it through to a servo connected to the output. This is very handy as the vast majority of RC systems use percentages for servo travel, which is largely meaningless. Just what is 100%? with all the trims, sub trims, expo and mixes what is really coming out of the receiver? The pulsewith could be well out of spec, which the Servo Tester you can double check. 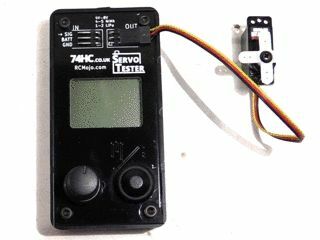 It’s not just RC the Servo Tester’s useful for, it’s quite common to use servo’s in robotics, most Arduino robots, robot arms, anything with articulation really, use servo’s. With the servo tester you can find the precise position you need to set the servo, you can use servo.writeMicroseconds(uS) with Arduino and simply use the value displayed on the Servo Tester to match the position on your robot. If they don’t match you can connect the Servo Tester to the Arduino and check to see if it’s outputting what you think it should be.